About an hour later I ran into Dlight of Tribal Oasis, who spoke eloquently of creating this type of post-modern tribal community full time. His ideas are very compelling and he now has me convinced of their attainability. He went on to tell me that regardless of what we've been told, hierarchy has ended and we now need to get used to living without those rules. The technologies of liberation are expanding so fast, that hierarchy simply cannot survive, and so we as a species need to finish the job of deprogramming ourselves out of this primitive hangover. He also mentioned that the singularity is really just another form of misguided monotheism, another type of hierarchy. The future is not a singularity, but a Cambrian explosion of diversity and creativity heading out in every direction. Hey, I'm with you. I want to believe! 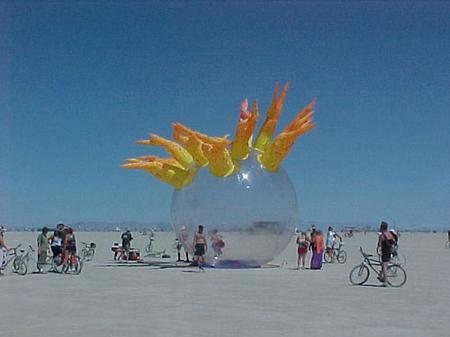 Burning Man is a super-condensified experience - a day can seem like weeks have passed. I never escaped the feeling that I had landed on some beuatiful alien planet filled with novel delights at every turn. This alien feeling was immediate and viceral and I didn't want it to end. No manner of sci-fi movie watching can prepare you for it. A cross between Barbarella, Mad Max and Tatooine might give you a hint, but that's all. In the end change is constant and Burning Man will inevitably fade, hopefully to be replaced by another similar current, appropriately occulted from dilution and evolved to bring newer generations closer to the utopic ideals of it's founders - ideals that are really the same ideals shared by all of us since the infancy of humanity: warm companionship and community, expression and creativity, freedom from meaningless routine, and a communion with the ineffable and un-namable mysteries of creation. Burning Man is simply one point in time carrying the current onward, sustaining and nurturing the human spirit as it blossoms into hyperspace. What can I say. Yes, we want it. Life could be different. It takes felt experiences to really take us somewhere else, where we better belong. Critical mass can happen at any time. Love the burning man thing , ritual, but I have never made either. Almost invariably do we indeed need these changes and as you say critical mass can occur any time it is a occurring as we speak. The planet is ready and what we need and should design is the tool box of Mona cultural evolutionary triggers and system adjustment tools for manipulation of pre chaotic response effect just before critical mass. After seeing and thinking about your last entry of the evolutional triggers and reading the links there, it is apparent that those moments when things are hanging in a balance before tipping are crucial to the new direction when major systems are all on that out side curve and the beginning of an unstable wobble. A question of balance, the Moody Blues said it quite well. If a variety of different plans to create systemic pressures could be or arranged to initiate and proceed at the proper times, and perform these actions all with in their design. Sort of like an automated controlled inductive chaotic decay, that would break down systems in a fast but UN damaging way. At the same time a variety of predetermined new cultural systems seeds could be released. By seeds I mean assemblies of brainware, eccoware, bioware, others?That are symbiotic and sinergenicaly related and wholistic in nature. Have in place the nutrients to activate, propel and thus the genesis of the new systems. Alternatives to the old system that would function better and have progressive traits that look and, function positively in design. I think the people at NCN have created the basic design parameters for this and have many of these systemic ideas for such a tool box, change a little here and there; they would become excellent tools for the planet. A plan could be arranged on the method of their use and how to use them. Incorporating things that tune the variety of complex variables of planetary systemics like the timing, torque , calibration of these variables. ;) Solidify the design and its components bringing them out of virtuality, prepare them and the box to be there when you need it, explain their use and their effect, describe their function. So that all will understand what's happening. Apply the appropriate pressures in the right places and in still the right pattern to set a new direction. Possible ideas for a direction of action plan. Sir. and I think you're on to the right direction and path. :) aha moved again in mind and I am, I think. Indeed, if the conditions are there, the chaos just before a tipping point - what suddenly becomes of paramount importance is what kinds of seeds are around. The kinds of attractors that are available would suddenly become very important, maybe determining the makeup of the new system. And, yes, are we actually up to both apply pressure to the old system, in just the right way, and happen to have placed the strange attractors strategically well. Big responsibility. Not to mention hard, to be big time evolutionary agents. Luckily I think it is not just up to us to figure out mentally. It might be as much about discovering and riding the currents that are there already. Sensing what is ready to emerge, and helping it along. I think the movement/expression of BurningMan is a facet of the evolving mind of man, of those who are able to have glimpses beyond the pevailing three dimensional conformity. The meaning of the movement might be a pointer toward fourth dimentional evpression, and four dimensional realities. Mathematicians have expressed this fourth dimentsion only on two dimentional paper. They understand it in three dimensions, yet the real proof must be demonstrated within the daily life of Here and Now. It can only be felt and experienced by the "exalted" moments of those who are able to be a part, are gifted with fourth dimensional participatory cognition, souch as lovingness,nirvana, extreme creativity etc. When ve arrive to the wisdom to be able to create the right tools to demonstrate and be able to change the word Universe to Multiverse, to change our behavior accordingly, we can actually begin to live by the expanded possibilities of multiple dimensions, what to me Hyprspace implies. Yeah, we need more dimensions. With one or two more dimensions of experience lots of things will suddenly fit together that didn't quite make sense when you saw them in too few dimensions. And, yes, some of our irrationel passions might well be a sensing of how things flow well in a hyper-dimensional space. From a perspective of two-dimensional thinking it maybe makes sense to just take care of one's own backyard and hoard resources for oneself for a rainy day and to mistrust everybody else. From a vantage point of seeing more dimensions, that might very well look incredibly unnecessary and barbaric. Like an animal that eats its own children because it is hungry. Your's is the inletligent approach to this issue. Eduards saka:GraudiÅ†am!Bet man ir TICAMA informÄcija,ka Gudmans-pareizais uzvÄrds-ir Å¾Ä«ds!Pie tÄm noViÄ¼Äniem,vai VarakÄ¼Äniem,te varu kÄ¼Å«dÄ«ties.Bet ja netici savÄm acÄ«m un ausÄ«m,tad palasi TALMÅªDU!Esmu pÄtriiecinÄts,sapraÄ«sl,KÄ€PEC VIÅ…Å IR TIK DAUDZ Ä»AUNA DARÄ«JIS MUMS!